As highlighted in this prior post, in September 2015 the DOJ released this memo authored by DOJ Deputy Attorney General Sally Yates titled “Individual Accountability for Corporate Wrongdoing” (the so-called “Yates” Memo). The “Yates” Memo was met with mounds of criticism including from former high-ranking DOJ officials. Against this backdrop Yates, not surprisingly defended her namesake memo. Her remarks focused on individually accountability, cooperation, and how the Yates Memo is working in practice. As to this later issue, Yates, not surprisingly, stated that the memo is “causing positive change within companies.” This claim of course is difficult, if not impossible, to verify empirically. Yates also touched upon the DOJ’s recent FCPA “Pilot Program.” (See here for the article “Grading the DOJ’s FCPA Pilot Program”). “First, I want to make clear that holding individuals accountable for corporate wrongdoing has always been a priority for the Department of Justice, both for the leadership of the department and for the line prosecutors who work the cases. And that’s because we all know how important it is to the success of our enforcement efforts. The bad acts of individuals have grave consequences, from the loss of jobs to the corruption of government officials, from the foreclosure of homes to the destruction of financial security and economic confidence. So holding accountable the people who committed the wrongdoing is essential if we are truly going to deter corporate misdeeds, have a real impact on corporate culture and ensure that the public has confidence in our justice system. We cannot have a different system of justice – or the perception of a different system of justice – for corporate executives than we do for everyone else. But as I and others at DOJ have said before, these cases do have a special set of challenges, challenges that can impede our ability to identify the responsible parties and to bring them to justice. It is not easy to disentangle who did what within a huge corporate structure – to discern whether anyone had the requisite knowledge and intent. Blurred lines of authority make it hard to identify who is responsible for individual business decisions and it can be difficult to determine whether high-ranking executives, who appear to be removed from day-to-day operations, were part of a particular scheme. There are often massive numbers of electronic documents and for corporations that operate worldwide, there are restrictive foreign data privacy laws and a limited ability to compel the testimony of witnesses abroad. I imagine that all of you here have witnessed these dynamics firsthand. It was because of these two competing concepts – that, on the one hand, we believe it’s critical to hold individuals accountable and on the other, doing so poses real world challenges – that we convened a working group of lawyers from all across the department – both litigating components and U.S. Attorney’s Offices – to take a look at what we’re doing and how we’re approaching our corporate matters. The goal was to ensure that we’re doing everything we can to overcome the barriers that I just mentioned and hold accountable those who are responsible for corporate wrongs. In some areas, we identified best practices that were being followed in certain parts of the department and that we concluded should apply department-wide. In others, we decided to make some changes and add new policy requirements. And the Individual Accountability Policy was the end product of those discussions. “We now require a company to provide all the facts about individual conduct in order to qualify for any cooperation credit. We have sought to increase coordination between the criminal and civil sides of our house and require all our attorneys to focus on individual liability from the very beginning of an investigation. We will initiate civil proceedings against a bad corporate actor, even if that individual may not have the financial resources to satisfy a large money judgment. And we have shifted the presumption on what a corporate resolution looks like: now, our attorneys must get approval if they decide not to bring charges against individuals and may not release individuals from civil or criminal liability except under the rarest of circumstances. After we announced the individual accountability policy, it was the threshold cooperation credit requirement that received the most attention. But, as I’m sure many of you would agree, the notion that a cooperating company must relate facts about the conduct of individuals within the corporation is nothing new. The principles of federal prosecution of business organizations had long provided that companies that want cooperation credit should identify who did what. That concept has been repeated by department officials over and over again for the last several years in just about every speech given on corporate fraud. But despite all that, we found that we still got passive voice, “Mistakes were made,” presentations from defense counsel, without identifying who made what mistakes. Companies were still expecting to get cooperation credit, even though they hadn’t really advanced the ball at all in determining who did what. And sometimes, companies still got credit for cooperation even though they hadn’t provided what is most valuable to us – the facts about individuals. So, we decided to make that information a threshold factor. While the requirement to provide all facts about individuals isn’t new, what has changed is the consequence of not doing it. But let me be clear – this does not mean companies are required to conduct overly broad investigations or embark on a years-long, multimillion dollar investigation every time a company learns of misconduct, or what I’ve heard described as “boiling the ocean.” On the contrary, we expect companies to carry out a thorough investigation tailored to the scope of the wrongdoing. Nor will a company be disqualified from receiving cooperation credit simply because it didn’t have all the facts lined up on the first day it began talking with us. Rather, we expect that cooperating companies will continue to turn over the information to the prosecutor as they receive it. The determination of the appropriate scope and how to proceed is always case specific – it’s not possible to lay out hard and fast rules. Which is why, we’ve reiterated that if a company’s counsel has questions regarding scope, they should do what many defense lawyers do now – contact the prosecutor directly and talk about it. Already, based on reports on the ground, firms are doing just that. You should also know that counsel for the company is not required to serve up someone to take the fall in order for the corporation to get cooperation credit – a hypothetical person sometimes referred to as the “vice president in charge of going to jail.” Our goal is not to collect corporate heads. Our goal is to get to the bottom of who did what and if there are culpable individuals, hold them accountable. The week after the policy issued, I spoke to department prosecutors and said that if a company conducted an appropriately tailored investigation and truly did everything they could reasonably be expected to do to determine who did what, but simply can’t figure it out, they are not precluded from receiving cooperation credit. We don’t want this to be the exception that swallows the rule. We’re going to pressure test your investigation to ensure that you’re not using a purported obstacle as an excuse, but there is always a good faith element to everything the department does and that includes the Individual Accountability Policy. Likewise, we don’t expect a company to make a legal conclusion about whether an employee is culpable, civilly or criminally. We just want the facts. Our goal is to uncover the truth. We will make our own judgment about whether any action has criminal or civil exposure. 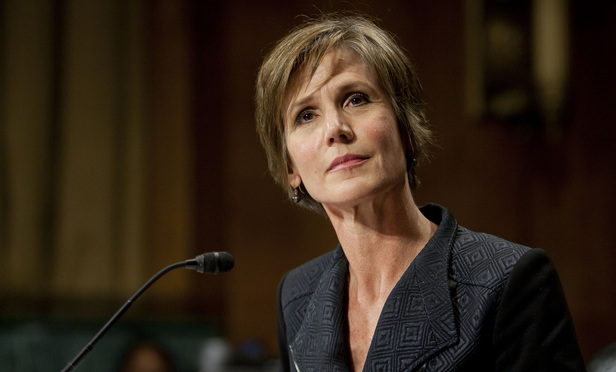 Yates next focused her remarks on how the “Yates Memo” has played out in practice. “Since we issued the policy eight months ago, lots of people have been opining about what it’s going to mean and what will happen as a result. But what we’re seeing so far is that there are two different worlds. There is the world of client alerts and bar articles, where the cascading cavalcade of terribles is laid out in startling terms. And then there is the world of real life – of real cases and real lawyers. And right now, those worlds are very different. So let me spend a few minutes on how implementation of the policy is going so far. First, we’ve read some predictions that companies will no longer cooperate with the government as a result of the policy. That has never made a lot of sense to me, that rather than providing all the facts about who did what within a company, the company would decide to forego the substantial benefits accorded cooperation and just roll the dice. That seems a particularly risky calculus, especially for a publicly traded company. While it’s always possible that a company will make that calculus, I am not aware of any company that has refused to cooperate because of the new policy requirements. On the contrary, from what I’m told by our folks, companies are not only continuing to cooperate, they are making real and tangible efforts to adhere to our requirement that they identify facts about individual conduct, right down to providing what I’m told are called “Yates Binders” – an unnecessary term if you ask me – that contain relevant emails of individuals being interviewed by the government. Moreover, to my knowledge, no one has told us that they will be forced to waive privilege in order to comply with the policy. I previously invited members of the white collar defense bar to let me know if this is not the case and that offer still stands. I have yet to receive a report about a privilege waiver, but I continue to invite you all to bring forward any specific examples of unintended consequences of the policy. And it’s not just that we haven’t seen the dire predictions come to pass. We’ve affirmatively been hearing that our new approach is causing positive change within companies. Compliance officers have said that our focus on individuals has helped them steer officers and employees within their organizations toward best practices and higher standards. That’s exactly what we had hoped for. After all, it is much better to deter bad conduct from happening in the first place than to have to punish it after the fact. Just as the policy does not seem to have brought about the end of western civilization from the companies’ perspective, it’s not business as usual at DOJ either. In fact, in just the few months since the release of the policy, I can tell you that we’re seeing a shift in how we approach cases at the department, both on the criminal side and the civil side. On the criminal side, our lawyers aren’t just talking about the potential culpability of individuals at the time they are resolving an investigation, they are thinking about individuals from the investigation’s very beginning. I’ve seen it firsthand as we have sat around my conference table and I’ve been briefed on significant new matters. The first thing the lawyers briefing me discuss is what we are doing to identify the individuals involved and what the company is doing during the course of its cooperation to meet its obligation to provide all the facts about individual conduct. Yates next focused her remarks on the DOJ’s FCPA Pilot Program. “In addition to these big picture changes, the Individual Accountability Policy has led different corners of the Justice Department to announce new component-level policies focused on individuals. French Anti-Corruption Law Reform: A Paper Tiger Or A Paradigm Shift?